What do I mean by Process Oriented Bodywork? Emotional-process oriented bodywork is more like it. This unique type of bodywork combines several modalities and the gentle and kind principles of safety from Birth Process work. Working with the Polyvagal System – tracking the nervous system and seeing what is the client’s capacity, tracking where they are regarding sympathetic or parasympathetic charge, sensing how embodied they are at the moment – this is one modality. Craniosacral Biodynamics is another. This works with the subtle fluid body as the practitioner tracks the cerebral spinal fluid and its rhythms, connecting with the inherent health which is never lost. Then there is Birth Process work – Pre- and Perinatal Psychology from the lineage of Myrna Martin and Ray Castellino. I mention their names because the Principles that Castellino arrived at differentiate this work from other birth process type work (regression, etc). The principles allow deeper safety from going slow enough, from asking permission to make contact, including eye contact and more allow for a profound container for the client to drop into. Kirby is also supported by years of meditating. He has primarily worked with Tibetan Lamas – teachers and monks / nuns from Tibetan Buddhism. However, he initially began meditating with Zen Buddhist teachers, and he works with Western teachers as well, in particular Julie Henderson’s work with Zapchen Somatics and allowing everything to move (inner and outer). If you get the chance, type in, “Process Buddhism” to the search bar on the right and read that post. Quite interesting indeed! They must be willing to confront some uncomfortable feelings. Sometimes we have to feel it to heal it – that doesn’t mean we have to re-live the trauma (this can be re-triggering and counter-productive) – but we have to be willing and able and flexible enough to be present with what is. Next this work is typically not cheap. I don’t take insurance, and I only offer two appointments per week to people who need a pay-what-you-can type of rate. And even these clients must also have extra support outside of working with me – are they in a support group? Do they see a therapist regularly? Who has their back? Who can they lean into for extra support? This way I become a part of their healing / support team, not the primary person. What can one achieve by doing this work? The main reason people come in to see me is some acute (or chronic) issue – like migraines, or IBS, or a severely disturbed lower back, or digestive problems, etc. And I can usually provide a safe enough container that they process whatever emotional blocks were leading to these symptoms and complaints. So they start getting better within three to five treatments. But this work, over time, can also offer freedom and liberation from binding thoughts, beliefs, misunderstandings and habits. The question is: how far down the rabbit hole do we want to go? How much healing and clarity do we want? The answer to these questions might seem like, “I want to go as far down my healing path as you can take me.” Yes, we can do that. But here is a typical issue – as we change our own inner template, we shift internally. But the outer world may not. So people who we are friends with, or sometimes partners and spouses – they may prefer that we stay the way we were. That is why we go slow. So this process of negotiation can occur mindfully and gradually. Sometimes healing requires that we confront inner as well as outer limits to our freedom and authentic beingness. I seek to empower and promote health within all my clients. And we check in from time to time about how they are doing with integrating the work. Some people have more time and more capacity to integrate this deep work. So we discover the proper pace for someone, knowing that less is more and that by going slower, we arrive at our destination faster. This work can improve psychological boundaries, it can give us greater access to and clarity around our intuition, we will start to trust our gut feelings more, and we move toward deeper states of embodiment. Truly being present in our body and as our body. This is quite a radical idea – slowing down enough to actually listen to what our gut wants, or checking with with what our kidneys need for instance. Not the typical response to our rat-race-cultural-mentality! In retrospect, I believe that the ability to assist others through their healing process depends on the practitioner rather than the modality. The modality is just the tool – how skillful is the practitioner at working with that tool? So you need to work with a practitioner who has done their own inner personal growth work! With that said, the more tools we are competent with, the more body types / individuals we can benefit. So I am grateful for the past 15 years of study and learning, incorporating seven or eight modalities into what I offer. The healing journey lasts a lifetime and we are continuously growing. May we be kind and gentle to ourselves along the road and as a result, make lasting progress. I wish you well in your journey toward deeper insight, awareness, wisdom and clarity! 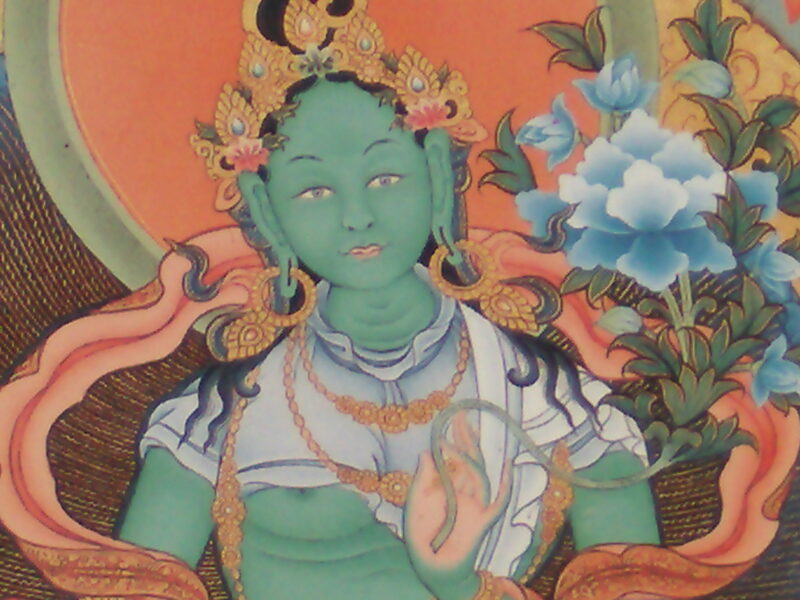 I am interested in the Photo of this Tara, would it be possible for you to send the original file to my email, so I can print out as my worship merit field? Thanks a lot! I am blessed to have many quality teachers. My “go to” guys would have to be Drupon Thinley Ningpo, Khenpo Tsultrim Tenzin, Khenchen Rinpoche, Konchog Gyaltsen, Hun Lye and Julie Henderson. Thanks for commenting. I’m fascinated by the diverse range of views and opinions. Who’s your “go to” guy?